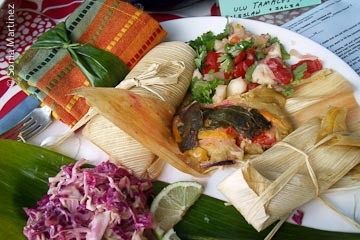 'Ulu Tamales were a big hit, winning both 1st place for main dish and healthiest choice. Have all of your ingredients in prep bowls ready to fill the tamales. Soak the corn husks and have ready; you can also use fresh corn husks, ti or banana leaves. You will need raffia or cotton kitchen string to tie the tamale 'packages' before steaming them. When the 'ulu poi is ready, take two leaves and place wide parts overlapping, start filling by spooning some of the poi, making a slight indentation in the poi. Start adding whatever veggies, goat cheese and meat (if desired), not too full. Wrap and tie. Steam them for 15 to 20 minutes if vegetarian. If adding meat, steam for 25 minutes. Sauté diced onions, garlic , chili peppers and mushrooms in 1/4 cup olive oil. Drain and cool. 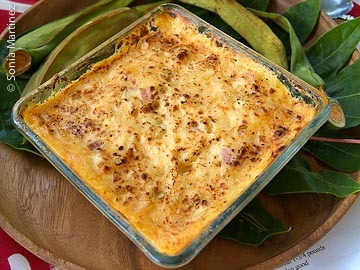 Place grated cheese in parbaked pie shell. 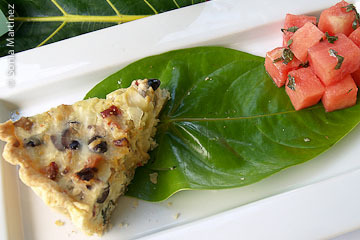 Top with breadfruit, basil, olives, goat cheese, mushroom and onion mixture. 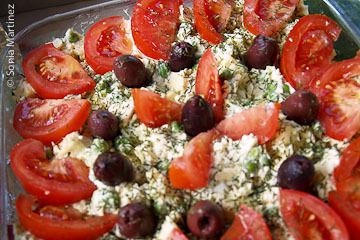 Sprinkle with olives and sundried tomatoes. Top with custard. Bake at 350 degrees for 50 minutes. Serve with mixed greens or fresh fruit. Boil chicken breast in a pot with skin, 1/2 teaspoon Kona salt and 5-7 peeled garlic cloves. Bring eggs to boil, leave them in the hot water for 15-20 minutes, then remove. Steam green peas for 5 minutes and drain water. Chop baby dill pickles to about 1/4 inch size. Cut large tomato into 8-10 wedges. Remove skin from cooled chicken and cut into 1/2 inch cubes. Remove 'ulu skin and cut in half then into 1/2 inch cubes. Remove egg shells and chop into 1/2 inch cubes. Mix all ingredients in a large glass bowl and add 1/2 teaspoon Kona salt and 4-5 tablespoons virgin olive oil. Mix well. Add mayonnaise to taste and garnish with tomato wedges and olives. Sprinkle dried dill weed or chopped parsley. Enjoy with lots of aloha! May be eaten at anytime. Wash 'ulu and cut into 1-1/2 in wedges (eight works) lengthwise. Peel, core and slice less than 1/4 inch thick. Layer in greased 3 quart (9 x 13) baking pan with ham. In a large sauté pan, lightly sauté crushed garlic in butter on medium-low heat. Don't scorch. Add Half & Half and cheese. Stir constantly until all cheeses are melted. Add /14 teaspoon white pepper or to taste. Salt is not necessary. Pour cheese sauce over 'ulu in the baking pan. Bake at 350 degrees Fahrenheit for about an hour, until 'ulu is tender and sauce is bubbly and golden brown on top.